WASHINGTON (CNS) — Marching up along Constitution Avenue, Trey Krause lost sight of his students. Surrounded by thousands in the heart of Washington for the annual March for Life, a majority of them young people like himself, the 26-year-old Krause searched the crowd for a McGill-Toolen Catholic High School banner, a sign for his Mobile, Alabama, group. But in a crowd of 100,000-plus, it was easy to miss all 167 of them. The annual trip to the nation’s capital for the group helps students grasp the reality and immensity of the abortion issue, Krause said. Krause was inspired by House Speaker Paul Ryan’s call to speak with compassion, a message he felt was good for his students to hear. The Catholic congressman from Wisconsin was among the many speakers who addressed the March for Life crowd Jan. 19, before the march along Constitution to the Supreme Court. Bill Olson, director of pastoral ministry at Strake Jesuit College Preparatory in Houston, agreed. Seeing his students stand up for life, to see abortion as not a woman’s issue, but a human rights issue, is a “beautiful witness,” the 26-year-old told the Texas Catholic Herald, newspaper of the Archdiocese of Galveston-Houston and one of several news outlets covering the annual event. For Carlos Cerda, president of the student pro-life group Crusaders for Life at Strake Jesuit, making that witness is an obligation. “I just feel that my generation has become the generation of waste,” the high school senior said. “It just seems to think that everything is disposable, and it’s even moved on to human life. 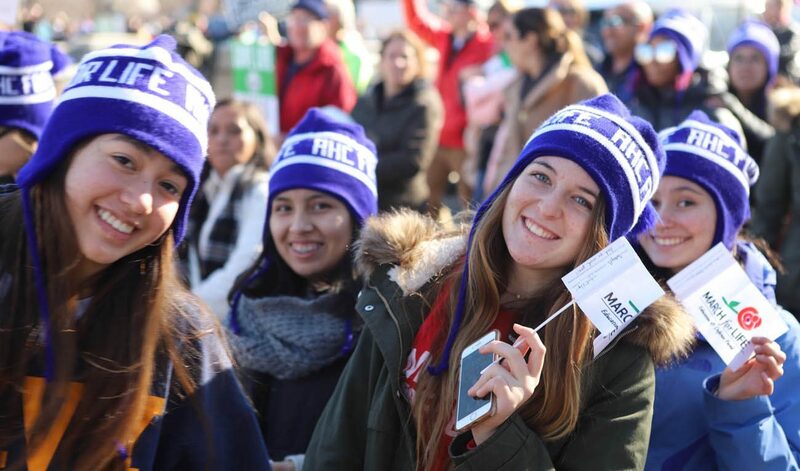 Showing the truth and dignity of the unborn is “just doing what Christians called to do,” said Jenna Salazar, president of the Celts for Life student pro-life club at the University of St. Thomas in Houston. Destiny Herndon-De La Rosa, the 34-year-old founder of New Wave Feminists, feels newer methods of spreading the pro-life message, like sharing stories on social media, are more effective than “old movement” techniques that often inflame and spark emotions. While the trend is young people being less religious and politically identified, she’s seen millennials like herself respond more positively to science and technology in understanding the dignity of the unborn and the struggles of women facing crisis pregnancy. Yet, she sees, like in generations past, “everybody wants to be a revolutionary … to be the Martin Luther Kings and the Harriet Tubmans,” she said. “I think a big part of it, is striving for a culture free from violence. That is the noble thing to do. And it’s bizarrely hard these days. Schaeperkoetter, who lost his home when Hurricane Harvey flooded his family home with almost a foot of rainwater and still lives out of suitcases, said he’s excited by seeing his students’ eager participation.